I think the name of the above compound should be 3-Ethyl-2-methylcyclohex-1-ene. However, according to my book (Organic Chemistry Resonance DLPD, page #43, question #5), this organic compound is 6-Ethyl-1-methylcyclohex-1-ene. A quick Google search shows relevant results for the later name but not for the former. As far as I know as a high school student, substituents should be given the lowest number and double bonds should be given the number 1 whenever possible. The name I thought of first satisfies these conditions better than the name the book gives as the answer. What did I do wrong? Which rule did I not follow? "Number the carbon atoms of the double bond as “1” and “2” in the direction that gives the substituent encountered first the smaller number." The methyl group right on the double bond is deemed first, so the carbon at that point on the ring gets 1 and the other double-bonded carbon gets 2, forcing 6 for the ethyl substituted carbon. The rules for naming state that if all groups have the same priority (which all alkyl groups and alkenes are), then you should assign numbering such that the lowest numbers are given. This isn't a sum of numbers; rather, it's the maximum possible groups with the lowest numbers. That might be hard to understand, but the idea is that if there's a chance to make 2 groups have the lowest possible number (1), then it would be preferred to anything that doesn't have that feature. The textbook answer has two groups with a "1" location (both the double bond and the methyl group attached to it), whereas your proposed answer doesn't. Therefore, it is preferred over your answer. Which is the correct name: 2,3-dimethyl cyclopentene or 1,5-dimethyl cyclopentene? What's the name of this organic compound? 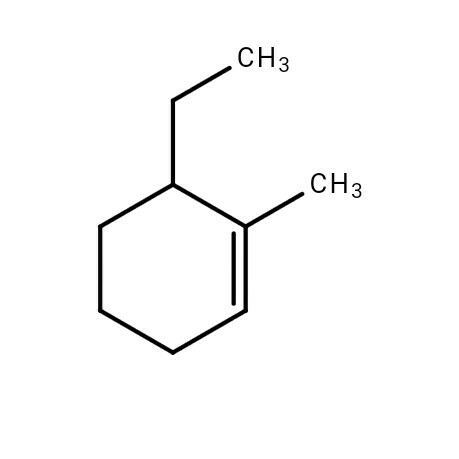 What is the name of this organic compound?